Acquiring biological and epidemiological data on parasites (source of inoculum, soil and climate conditions that favor pathogens, host plants, tolerant plants) is important to maintain the health status of seed potatoes and their growing environment. Improving epidemiological knowledge will enable better control through the use of non-reproducing crops (sanitizing plants), appropriate cultivation techniques and appropriate crop rotations. Knowledge of the evolution and diversity of pathogen populations is indispensable for the successful development of strategies based on genetic control. Surveys are underway to collect strains/isolates/populations of different types of pathogens (pectolytic bacteria, fungi, viruses). 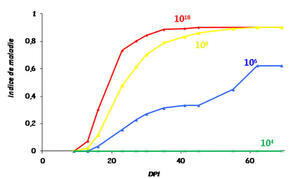 The populations of pathogens are characterized using phenotypic criteria (sexual types, aggressiveness, virulence) and molecular techniques to evaluate the likelihood (or the risk) of changes in pathogen populations. These data are then compared with data on populations from other countries. The effects of cultivation practices, (products used), of rotation crops or intercrops on the kinetic development of soil pathogens are analyzed using suitable detection or quantification methods. Risks due to commercial exchanges and climate change must be taken into account. Biovigilance (i.e. the detection, gathering and analysis) of information regarding the risk of introduction of new potato pathogens such as Zebra chips (Candidatus Liberibacter solanacearum), as well as new strains or isolates of pathogens that are already present in the territory. Exchanges and collaborations with specialized international research institutes and professional organizations.